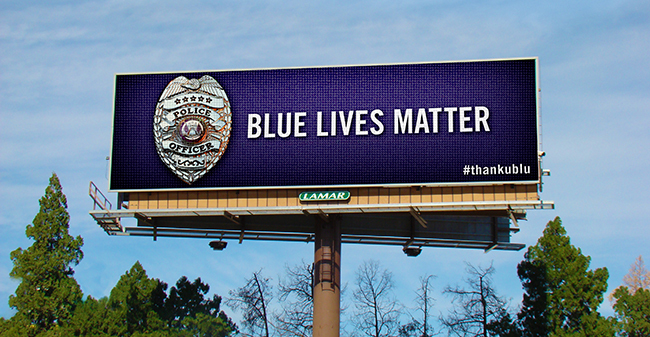 MEMPHIS, TN – September 29, 2015 – Tactical Magic, a Memphis branding agency, and Lamar Advertising Company, one of the nation’s leading outdoor advertising media firms, have launched a series of digital billboards across the country in support of the nation’s law enforcement officers. Titled Blue Lives Matter, the images were created by Tactical Magic earlier this year when a civic-minded Memphian asked Tactical Magic’s creative director, Trace Hallowell, to help him honor local police officers. “The idea initially was to salute those men and women who serve us in law enforcement,’’ said Hallowell. The first billboards were posted in various locations around Memphis in June. After a series of attacks around the country in which police officers had been targeted for assassination, Hallowell proposed that the advertising campaign should be extended with a new message: Blue Lives Matter. “This time the message was simply to affirm the humanity of our men and women in uniform. No one should be a target of violence because of what they wear,’’ Hallowell said. The Blue Lives Matter billboards went up in Memphis on September 4. The response from citizens was overwhelmingly positive, Hallowell said. Lamar Advertising soon was on board to put the message on its company-owned billboards across the country as a public service effort. "At Lamar Advertising Company, we are proud to support law enforcement," said Lamar Advertising Vice President of Governmental Relations Hal Kilshaw. "We're using our digital billboards to voice respect for police officers across the country who put their lives at risk every day to keep the public safe. This is our way of saying thank you." Digital images were distributed by Lamar on September 23. They have been posted around the country, from Oregon to New York and from Iowa to Texas. (The #thankublu hashtag is shared via Twitter (@thankublu), Instagram (@thankublu) and Facebook (facebook.com/thankublu). Tactical Magic is a branding agency that specializes in the art of using strategies, words, and imagery to build a favorable perception with the goal of persuading business prospects to become customers. Founded in 1902, Lamar Advertising Company (Nasdaq: LAMR) is one of the largest outdoor advertising companies in North America, with more than 315,000 displays across the United States, Canada and Puerto Rico. Lamar offers advertisers a variety of billboard, interstate logo and transit advertising formats, helping both local businesses and national brands reach broad audiences every day. In addition to its more traditional out-of-home inventory, Lamar is proud to offer its customers the largest network of digital billboards in the United States with over 2,000 displays. Please feel free to explore our website www.lamar.com or contact us for additional information. The out of home (OOH) advertising industry, led by the Outdoor Advertising Association of America (OAAA), today launched a new campaign designed to prove the unique strengths and marketing effectiveness of OOH. 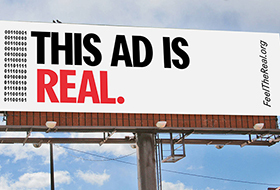 Lamar Advertising donated OOH media space in New York, Los Angeles, Chicago, Dallas, Austin and Detroit to support the "Feel the Real" campaign. 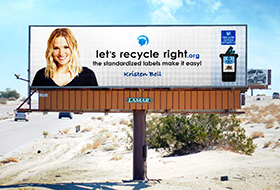 Beginning this week, Lamar billboards will begin displaying the faces of celebrities such as Angie Harmon, Kristen Bell, Bill Maher, Elvis Nolasco, Stana Katic, AnnaSophia Robb, Ian Somerhalder and many others who are introducing the society-wide standardized labels for recycling bins to begin repairing U.S. recycling.